Man, you guys LOVE Cake Pops! I was not expecting such a response to my Chick Cake Pops and my Snowflake Cake Pops, but since you love ’em so much, I’m gonna keep making them. 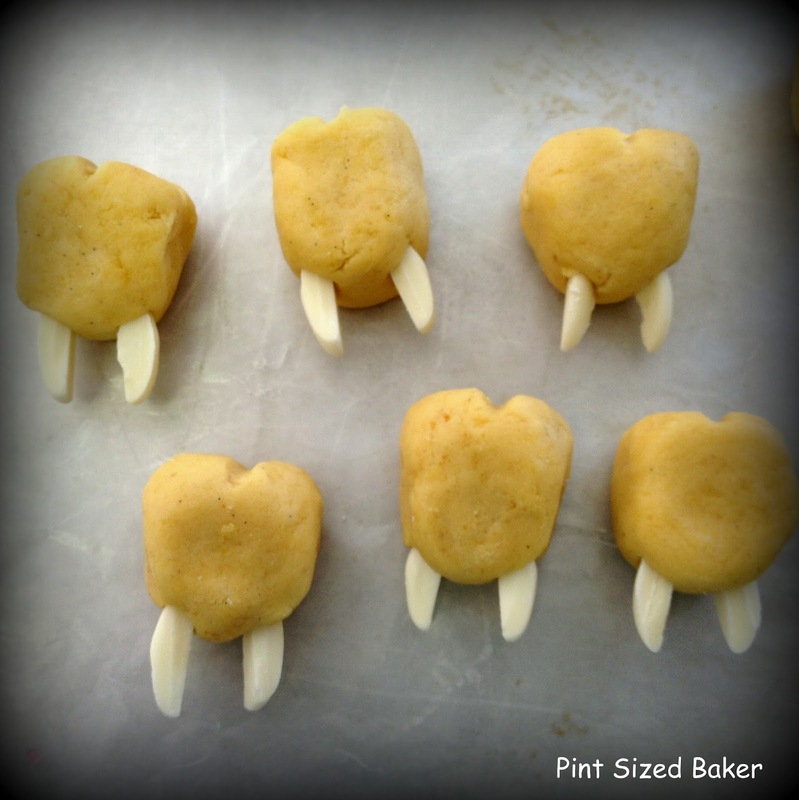 I had a special request for some Teeth Cake Pops, so I decided to document my process. Mix the cake and the frosting to make the cake pop batter. Divide the mixture into 12 equal parts. I generally get 12 pops per 1/4 cake. 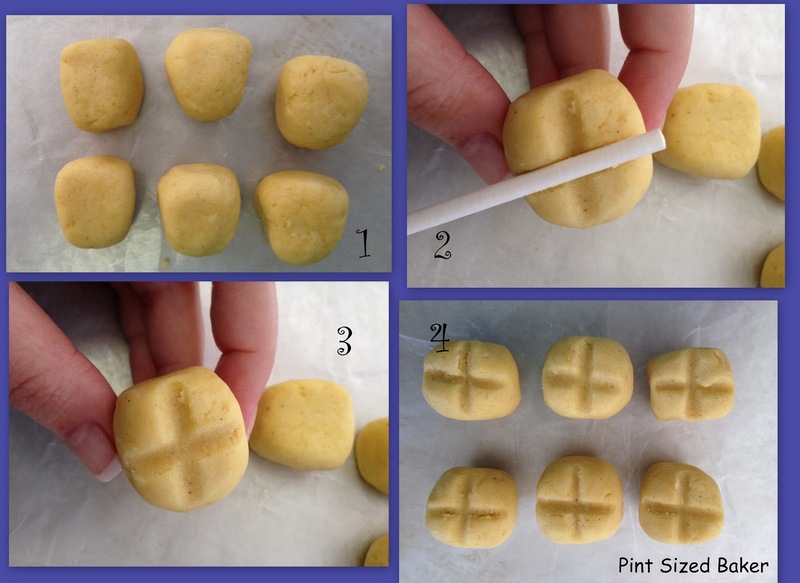 TIP * Use a tablespoon to measure them out. Shape them into a trapezoid. Longer and fatter on top, tapering down to the root. Using the lollipop stick, make an indentation on the top part of the trapezoid. This is the top of the molar-like tooth. Once all the indentations are made, pop them into the fridge for 15 minutes. 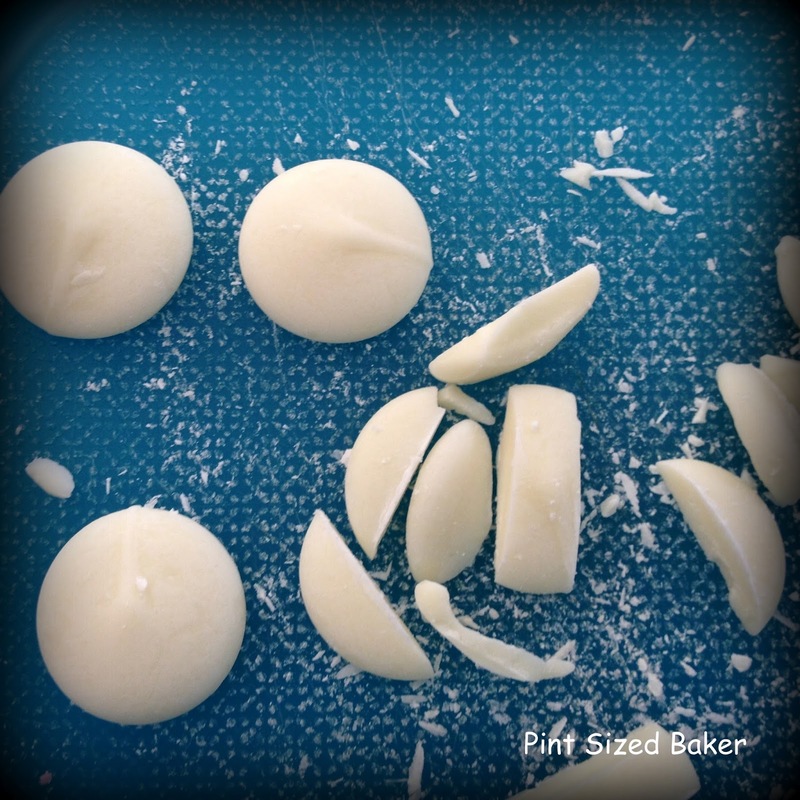 Take a few of the candy melts and cut them into thirds. These pieces will become the roots. Pull the teeth out of the fridge and insert the candy pieces. They kinda look like insect pincers, don’t they? Um… let’s not think about insects…. Set them back in the fridge while you melt the rest of the candy wafers. Start off at 1 minute at 100% power, then only 30 second increments at 70% power. You want to stir and stir and NOT get it too hot. If you pop it back in the micro and it only seems to be thicker, it’s too hot! Stir, stir, stir and wait 15 minutes for it to cool. 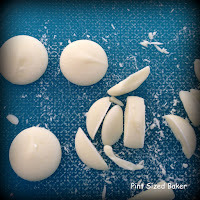 Or add more melts to absorb the heat. It will thin out. I promise. Be PATIENT! Back out of the fridge to dip! Holding the top of the tooth, dip the bottom third of the pop. Dip the roots first, then add the stick. 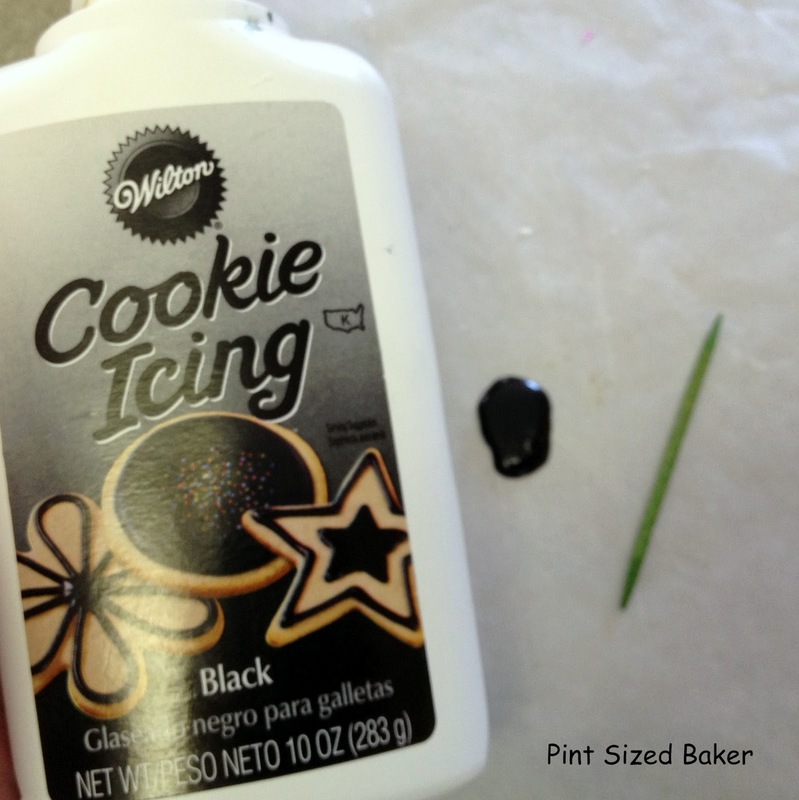 You may end up with some candy between the roots that’s a bit thick, just use your stick to remove it or shake the excess off. Stand your half dunked pop in a stand until the rest have their pants on as well. Once all the pops have their pants on, go back to the first one for a full dip. Dunk the pop up to, but not over, the stick. Tap off the excess and allow them to dry back in your stand. While the coating is wet, add the heart sprinkles for hair bows for girls or bow ties for boys or add a flower sprinkle. Be creative. All dressed! Now for some make-up! If you are adding a face design, my secret thing to use is Cookie Icing. Much better results compared to the Food Writers. I just don’t get the best results from them. 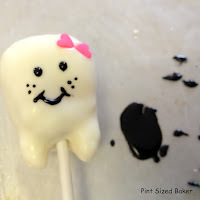 Add a small amount of the icing to your work surface and using a toothpick, draw on the face. TIP * A little bit goes a loooooong way! I’ve also used silver and gold luster dust to add the look of cavities. Maybe you can make a little crown for one! Or make a bridge connecting two! Oh the possibilities! Take them your Bestie or your Dentist! They are also great for little ones who are expecting a visit from the Tooth Fairy. Do you want to know where I got my great Cake Pop Stand? Check out KC Bakes for her wonderful assortment of sizes and designs! Now, go play with your food! Love these!!! The next time I sew this little tooth pillow I am making your tooth pops to give as a gift along with it. Simply precious! That tooth is adorable! The cake pops would make a tasty addition. Thanks so much for visiting. So. Flipping. Cute! I totally wish I could do that. Would you make me some instead? Don't get frustrated. 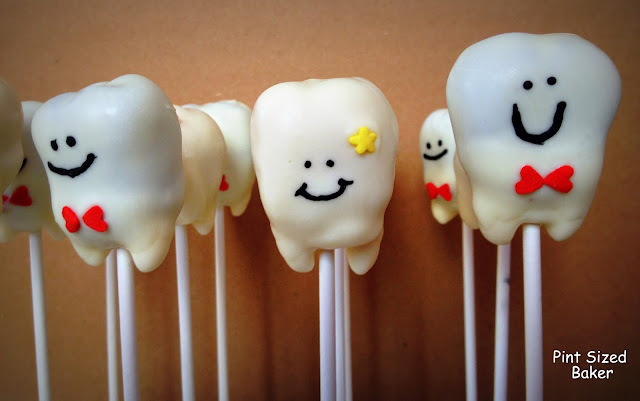 These are simple pops to make. No sprinkles or decorations to worry about. I'm sure you could make these! These are so so so adorable. You amaze me! Super adorable. Pinning this idea until my hubs graduates from dental school! Thanks so much and good luck to him with schooling! I'm sure the entire class would love them! How adorable! I have a friend who is a dentist so I sent her the link to these. She's going to love them! I would love it if you would link up at Watch Out, Martha!’s first link up party: Martha Mondays, going on now through Wednesday! Hope to see you there! Thanks so much for the invite. I linked up. Good Luck with your first link up party and thanks for visiting. These are the cutest things ever! LOVE!!! Thank you so much for sharing these at Whimsy Wednesdays. those are the cutest things! 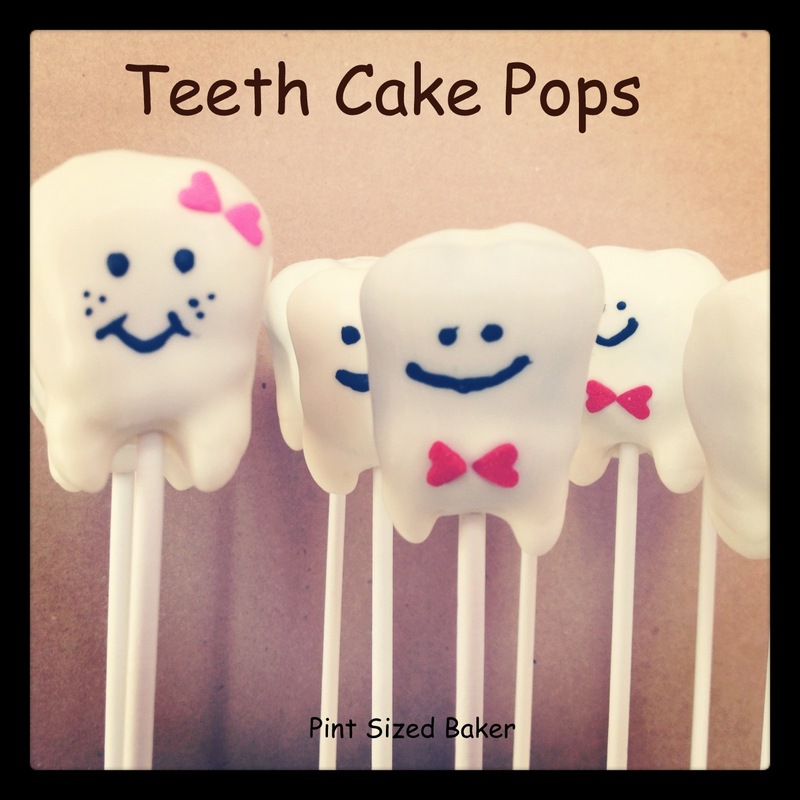 I have wanted to make tooth pops for a while but always thought it would be a pain to shape them, this is perfect! These are so cute – you're so creative! These are soooo stinkin cute! Love the little bow ties on the males 🙂 I would LOVE to have you share this at my link party and even enter the giveaway thats going on! These are just adorable! Thank you so much for sharing your awesome recipe with Full Plate Thursday. Hope you have a great week and come back soon! 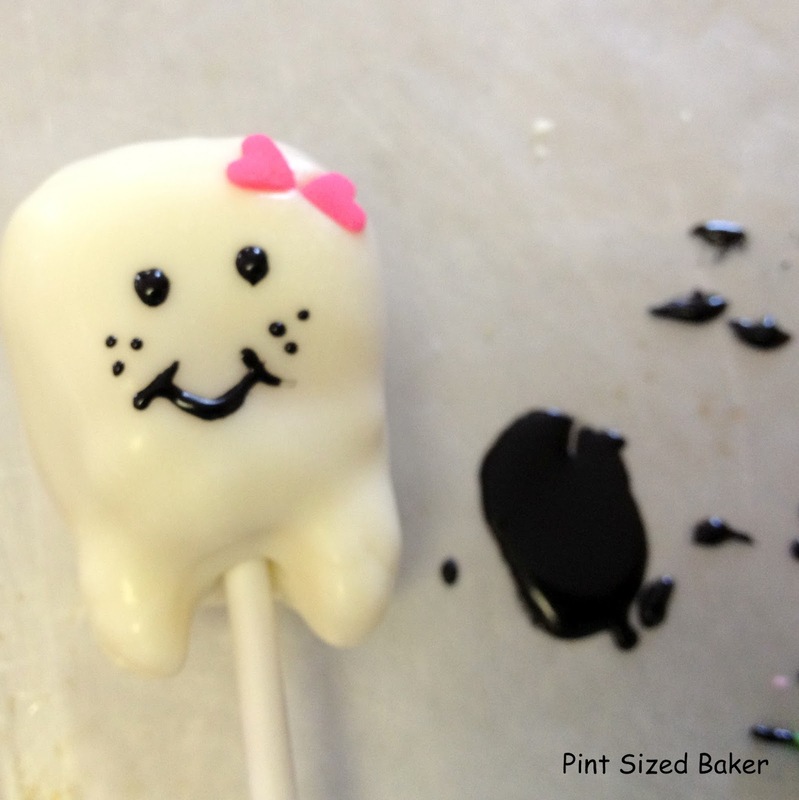 My tooth pops keep falling apart when I dip them in the chocolate! Thoughts? Love these! I want to make them for my brother-in-law, a recent dental school grad but he lives an hour away. Could I make them and freeze them until I deliver them?